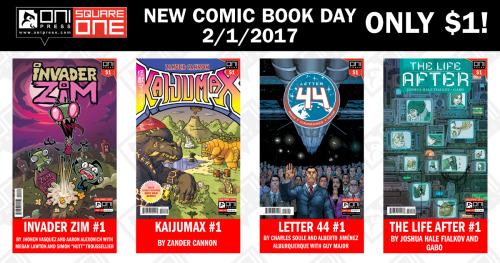 Happy New Comic Book Day! Today is the kick-off of our SQUARE ONE program—first issues of our flagship titles for only $1! Find your local comic shop with findacomicshop.com or comicshoplocator.com and add your favorite comics to your pull list so you never miss out on an issue! Which of our dollar comics are you excited to read this week? ATTENTION INVADER ZIM FANS! Here are the new on sale dates for INVADER ZIM issues #17–19! Happy New Comic Book Day! On sale today is INVADER ZIM #14 by Eric Trueheart and @sketchhero-warren with @artofstresing! Alternate cover illustrated by Billy Martin of Good Charlotte! INVADER ZIM #14 is available now at local comic book shops, ComiXology, and iBooks. Find your local comic book shop with findacomicshop.com or comicshoplocator.com and add INVADER ZIM to your pull list so you never miss out on an issue. Preview INVADER ZIM #14 after the jump! Listen to Nickelodeon Animation’s podcast interview with INVADER ZIM series creator @jhonenv about the cartoon and comic book series!